As April trickles away, I have been trying to get a good deal of writing out of my kiddos. 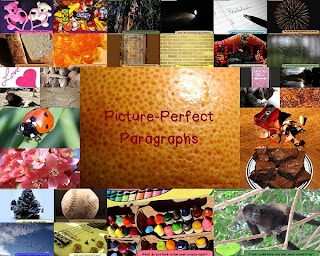 We have been working on a variety of different writing tasks, including a Paragraph Of The Week using my Picture-Perfect Paragraphs resource. Get it at TpT by clicking the photo! Last week, I found myself scrambling to locate a handful of unfinished pieces so I could get them marked in time to move on to something new this week. There had been a couple of kids away sick, others participating in dance or sporting competitions that had them traveling out of town, so I was missing a few. I had a handy-dandy slip of paper that I've got all their names on clipped to my pile, but in a few hurried moments in the previous two days there were papers handed in or taken back for a second look, and it was no longer up-to-date. By the weekend my brain was desperately rolling around ideas for making this process simpler! Excuse the upside-down clothespins - I was reusing these from another resource! A good lesson in remembering to split the class to either side of the chart!! I love the way you have it displayed - it looks like it could easily be moved or folded up when not in use - but when are you never writing!! I have some writing that I need to mark but I conveniently left it at school so I could have the night off! Thank you! It IS very easily folded up. I used Staples book clips to hook them together. I suppose ribbon or something would have worked nicely as well, but I like the extra bit of weight the clips give. GREAT idea!! After I saw this fabulous post...I started thinking how I could apply the same process you illustrate with other items in my classroom. We do warm up drills to practice multi-syllable words, fry lists, etc...and it is hard to keep track of where my kiddos are at. I love this idea! !